Bryan Eyink received the Celebrate Teaching Distinguished Educator Award from Battelle for Kids during a conference in Columbus on June 8. 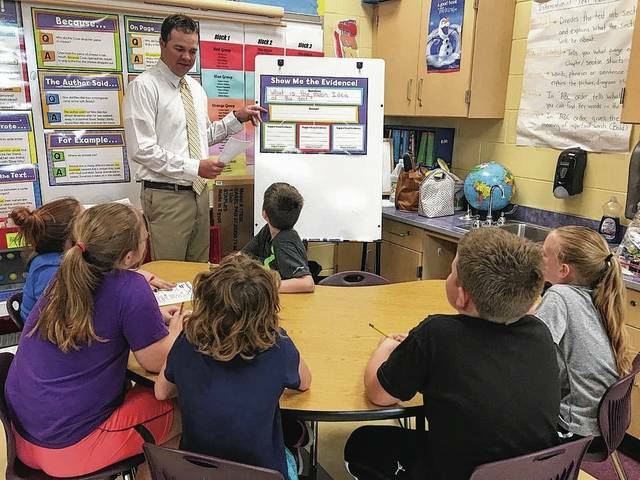 MECHANICSBURG – Battelle for Kids recognized Mechanicsburg teacher Bryan Eyink as a distinguished educator for his impact on his students, colleagues and community. He was among 33 Ohio teachers to receive the 2017 Celebrate Teaching Distinguished Educator Award during a program at the Educators Connect for Success Conference in Columbus on June 8. Celebrate Teaching is Battelle for Kids’ commitment to celebrate, support and inspire great teaching. Since 2012, the organization has recognized nearly 300 outstanding teachers who have shown powerful results in the classroom. The 2017 Class of Distinguished Educators were selected for demonstrating evidence of great teaching in multiple ways, including academic, non-cognitive, and community measures. “He establishes a respectful relationship with his students, and he motivates them to push themselves outside of their comfort zone. Mr. Eyink is a team player and a peer mentor to new teachers. He is a respected member of the community and always represents Mechanicsburg well,” said Christy Garver, principal of Dohron Wilson Elementary School in Mechanicsburg. Visit www.CelebrateTeaching.org to learn more about Celebrate Teaching and the 2017 Class of Distinguished Educators. With headquarters in Columbus, Battelle for Kids is a national, not-for-profit organization committed to collaborating with school districts and communities to realize the power and promise of 21st century learning for every student. Learn more at www.BattelleforKids.org. Submitted by the Mechanicsburg school district.